Nels served in Vietnam from 1968-1970. 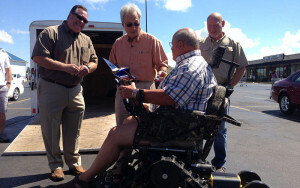 On Friday, August 23rd, 2013 POAM delivered an Action Trackchair to Nels Larsen, a Vietnam Veteran left with several health issues after being exposed to Agent Orange. Exposure to the chemical left him dependent on a cane, with several health issues including back problems and other ailments. Larsen was disabled veteran who had been helping other disabled veterans for years, out of the kindness of his heart. His deeds didn’t go unnoticed as a group called Bad River Outdoors nominated Larsen to receive the special all-terrain wheelchair. 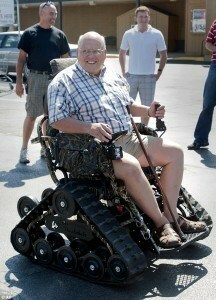 They’d previously taken Larsen on a turkey hunt where they provided him with an Action Trackchair for the weekend. Larsen was an immediate fan, and raved about the experience! So, the Bad River crew teamed up with POAM President Jim Tignanelli and they planned the perfect surprise. Larsen agreed to meet them for lunch and while Nels dined local media, friends and even the Midland Honor Guide prepared for the surprise. As Larsen came out of the restaurant and made his way back to the Bad River trailer, the entire group gave a huge cheer. Tignanelli exited the trailer on the Action Trackchair and addressed a shocked Larsen. He was visibly touched, and extremely grateful. Once the initial shock of the ordeal subsided, Larsen got on his new Action Trackchair and the Midland Honor Guard presented him with an American flag.